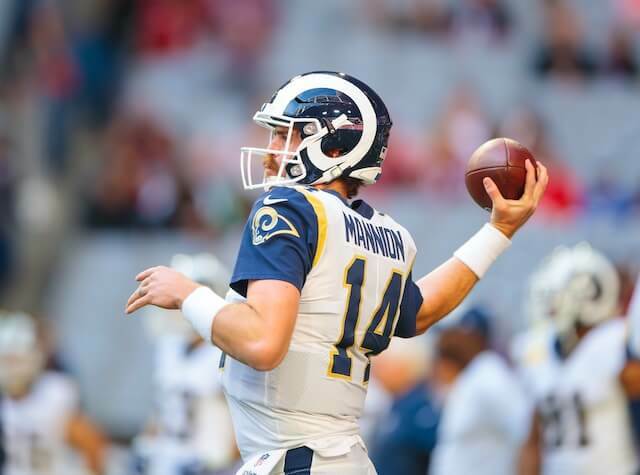 After drafting him in the third round in 2015 out of Oregon State, Sean Mannion has served as the primary backup quarterback of the Los Angeles Rams for the last four season. With Mannion hitting free agency this offseason though, the Rams decided to make a change behind Jared Goff by signing former Jacksonville Jaguars starter Blake Bortles to a one-year contract. Mannion appeared in just 10 career games for the Rams, starting one of them. He completed 33 of 53 passes for 258 yards with no touchdowns and one interception. While he didn’t make a ton of contributions on the field, Mannion was one of the longest-tenured Rams players dating back to their days in St. Louis and for that reason, many of his former teammates and coaches will surely wish him the best of luck in Minnesota.